Native to temperate regions of Europe and Asia, red clover is now naturalised in many parts of North America and Australia. The plant was known as "honey stalk", as children sucked the sweet sap from its stems. In the 1930s it became popular for treating breast cancer. Today it is mainly used for coughs, skin problems and menopausal symptoms. 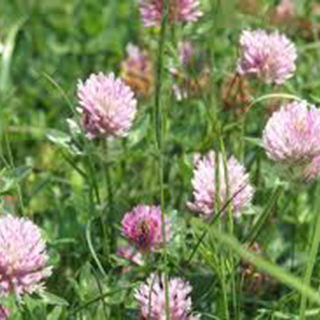 Red Clover is a blood-thinning alterative that helps the body efficiently remove metabolic waste products and prohibits the attachment and metastasis of abnormal cells. This is therefore one of the best single supplements for the prevention and treatment of cancer. The herb helps maintain normal estrogen levels during menopause for maintenance of healthy bone, skin and arteries, helps maintain normal blood pressure and cholesterol levels, and promotes youthfulness. Make an infusion of 1 cup boiling water over 1–3 tsp (5–15ml). Drink 1 cup 3 times daily for coughs, menopausal problems, or for skin problems. Make a standard infusion (see above) and use 1 pint (600ml) to make a syrup with 1lb (450g) of honey. Take in 1 tsp (5ml) doses as required for stubborn coughs, especially whooping cough or bronchitis. Use 1 cup of a standard infusion (see above) for mouth ulcers and sore throats. Take 1–2 tsp (5–10ml) 3 times daily for eczema, psoriasis, and old sores that are slow to heal. Combines well with heartsease for childhood eczema. Use frequently for lymphatic swellings. Use the crushed flowers directly on insect bites and stings. Prefers moderate summer temperatures and adequate moisture throughout the growing period. Scatter seeds where you want them to grow in late winter or early spring, and then cover with a light dusting of good compost. Gather throughout the summer, choosing newly opened flowerheads.